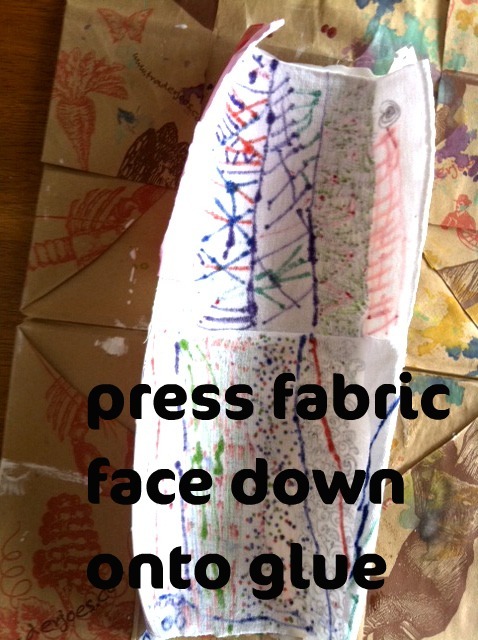 This is a quick craft to do with kids and I bet you have everything you need right at home. Here we go! Get a plastic bottle. 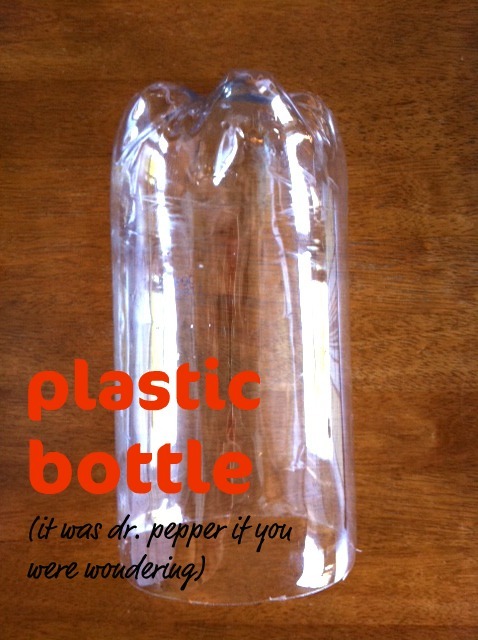 I used a 2 liter bottle, but I think a smaller bottle would work even better (you'll see why later on). Carefully, cut the top and bottom off and cut it open to make a rectangular shape. You'll need material. Any material will work. I used an old white t-shirt and part of a patterned dress of Vaughn's that didn't fit anymore. 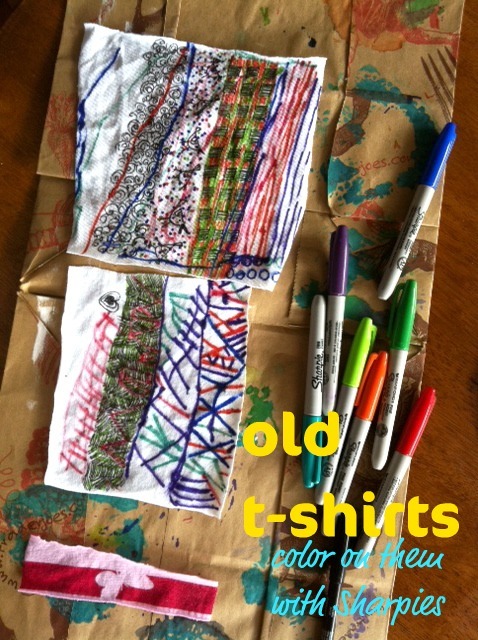 Draw designs with permanent markers. 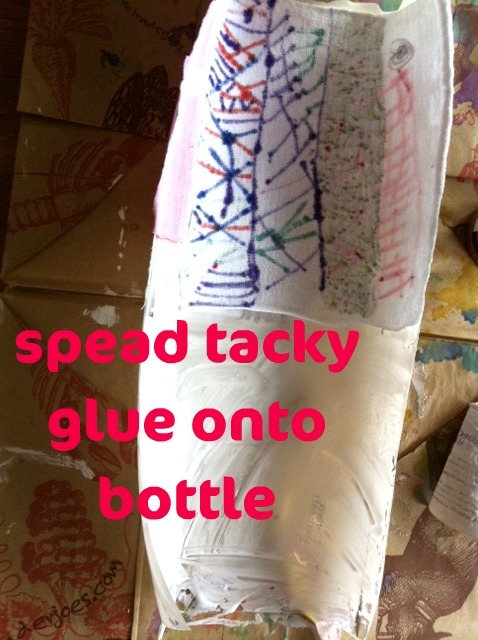 Use duct tape to tape the bottle down to cardboard. This will keep it from rolling up onto itself. You'll also need tacky glue. Spread a layer all over the inside of the bottle. I used a folded up piece of magazine to spread it out because I'm high tech like that. Don't worry, it dries clear. Press your already drawn on fabric, face down, onto the glue. Let it dry completely - mine took more than a few hours. For the kids I stuck to 1 inch wide by 5 inches long. 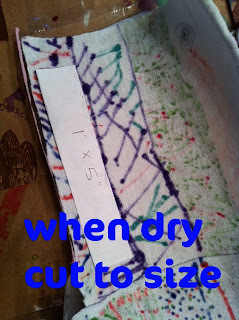 Cut with sharp scissors or even a rotary cutter. Rounding the corners adds a nice touch also. If the bracelet is too loose, wrap a rubber band around it and let it sit in the sun for a few hours. I had to do this with ours. I think this is why using a smaller plastic bottle would work better than a 2 liter bottle. Or you could even use a paper punch to punch holes in the ends and tie it closed with ribbon. I think this project has definite jumping off potential. I'm tempted to try a more "adult" one for myself using a scrap of already patterned material and then using some sort of trim to finish the edges off. I'll keep you updated! By the way, I found this idea in Todd Oldham's Kid Made Modern book. I love this idea. I can't wait to try it myself. Awesome! I can't wait to make these with my nieces! Your turned out AWESOME. I just pinned this! Cute!!!!! I will have to try those! These are cute and really inexpensive! Thanks for the wonderful tutorial. Thanks so much for the great comments! I appreciate all the feedback. Hope you try it out and if you do, let me know how they turned out! I would have never thought of this. It's almost like a snap bracelet. Suzanne, you're right! That's exactly what they're like! New follower from the Creative Bloggers hop. Hope you stop by for a visit. Seaweed & Raine, I'm not sure that it would make a difference. The cotton t-shirt was nice because it soaked up the glue which makes it adhere well. Also, when you're pressing the material down into the tacky glue the material spreads and stretches quite nicely. You can work it in the direction you need it to go. Give it a whirl and let me know if you try it out! what a great way to upcycle! i would have never thought of this.. they don't even look like they are made from bottles! what a fantastically fun upcyle idea! I will have to try this with my lil fashionista - she adores bracelets so this would be a HIT! I will be sharing this on my FB page as well - so cute! 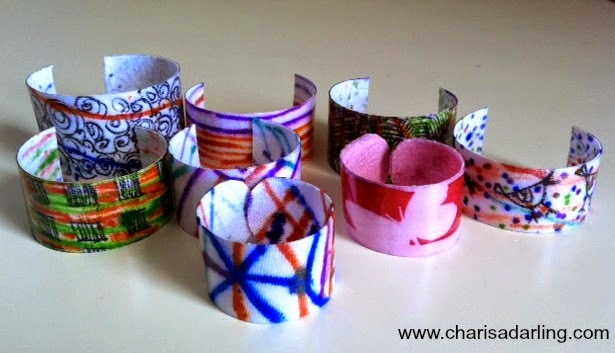 What a creative idea and yes I also can see some cool adult bracelets being made. Very cool! Wow! I'm more impressed with all the different blogs you've "linked" to...can you teach me how to do that? 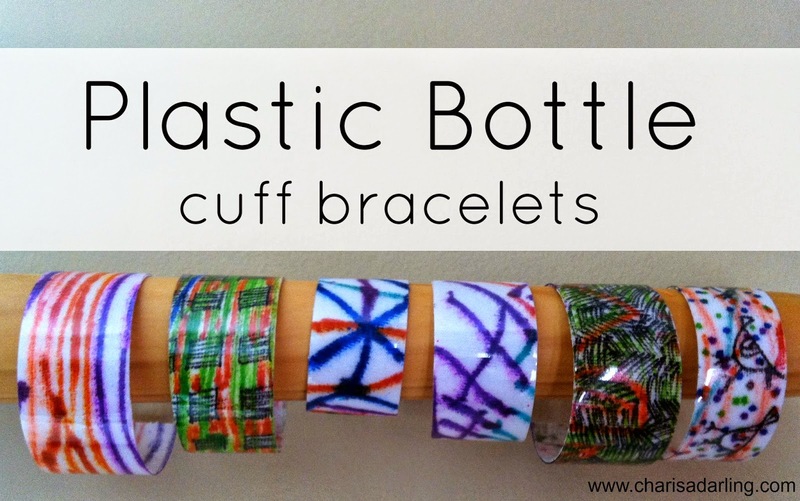 I came to your blog and loved the idea of ​​the bracelet pet bottle. It is good to have a blog which is showing such a great designs of bottles. Thanks for sharing. Do you think this is sturdy enough to use as a cuff blank? I've been looking all over creation for a diy-able one. Hmmm….It has been quite some time ago that I made these with my kiddos but I do recall them being more bendy than stiff. It uses soda bottle plastic and that type is pretty thin.